Delta Risk provides cyber security, cloud security, and professional consulting services to government and commercial clients. Founded in 2007, Delta Risk protects clients via cloud security services, SOC-as-Service, and managed detection and response, as well as professional services that include training and red teaming exercises, pen testing, vulnerability assessments, and incident response. Cloud solutions such as Microsoft Office 365 have simplified IT operations for thousands of companies. But trusting your business to off-site servers can present unique challenges as well. If your servers are hosted in the cloud, you can save money on your network's operational costs. However, you may be giving up control of your own security. How can you position yourself to proactively detect and prevent security incidents before they occur? If you’re curious about the answers to these questions, we invite you to join us! How can you plan for, detect, and respond to attacks in your hybrid environment, including cloud and on-premise? Join us for this webinar to find out. We'll explore differences and similarities between your approach for each, and what to keep in mind when looking for solution providers. Macie Thompson is Director of Delta Risk’s Incident Response team, providing incident response and compromise assessment support to commercial customers. She has more than eight years of experience in cyber security operations and training. Macie supports federal training and exercise programs, using her operational experience to develop realistic offensive and defensive cyberspace training curriculum and exercise vignettes for government clients. As Director of Critical Infrastructure Cyber Security at Delta Risk, Chris Murphy provides operational and strategic guidance for commercial and government clients. He specializes in helping organizations define and develop processes for incident response, monitoring infrastructures for security events, and detecting attacks. He has extensive experience in establishing and operating Computer Security Incident Response Teams (CSIRTs) and Computer Emergency Response Teams (CERTs), Cyber Security Operations Centers (SOCs), and investigative response teams, including those dealing with SCADA/Industrial Control Systems (ICS). Despite the cost and complexity of implementation, many organizations rely on security information and event management (SIEM) for network detection and response for on-premises applications. With the move to the cloud, however, traditional SIEM approaches won’t work. Nearly all organizations (90 percent) have at least one application in the cloud currently, or plan to in the next 12 months, according to IDG’s 2018 Cloud Computing study. Although cloud providers include security measures, IT professionals still face a variety of security challenges with software-as-a-service (SaaS), including lack of visibility into who is accessing applications and insufficient access controls. Join our experts for a live webinar with a Q&A for more insights on the cloud security landscape and why you should consider a cloud security solution in today’s hybrid IT environment. John Hawley is Vice President of Product Strategy for Delta Risk. Prior to joining Delta Risk in 2017, he served as Vice President, Portfolio Strategy for the Worldwide Security business CA Technologies. As the managed service market continues to grow as a whole, managed security is becoming an attractive option for organizations of all sizes looking to outsource their security needs or supplement in-house expertise. Industry analysts predict the managed security services market will grow to $40 billion market by 2022, fueled by a cyber security skills shortage and the rapid rise of new threats. Managed service providers (MSPs) looking to meet customer demands for managed security are faced with the challenges of building their portfolio from the ground up and finding staff. Partnering with a managed security services provider (MSSP) helps MSPs gain the advantages of a full suite of security solutions and access to highly-skilled cyber security analysts. Join our experts for a live webinar with a Q&A for more insights on the benefits of teaming with an MSSP, and why Delta Risk may be the right partner for your business. Your managed security services provider (MSSP) should be a partner in your business. Today’s MSSPs must balance emerging challenges from application, software, cloud, and network security threats while delivering assessment and response capabilities so you can focus on your business. The landscape has changed and there’s no turning back. Can your MSSP keep up? If you’re frustrated by complex pricing and feel like you still have to solve most of your problems, you’re probably in a bad MSSP relationship. Odds are, your business needs more than what a traditional MSSP delivers – but what defines a modern MSSP? Join our experts for a live webinar with Q&A to learn what characteristics and capabilities a modern MSSP has, and why it may be time to break up with your current provider. If you’re not yet using an MSSP, this webinar will offer valuable advice on how to find the right one for your organization. Stephanie Ewing, CISSP, CISM, PMP, is a Solution Expert with Delta Risk. She has 16 years of experience in information technology and information security leadership. Stephanie serves as Delta Risk’s cyber exercise capability lead and supports several key clients in industries such as Telecommunications, Financial Services and Energy. Threat Hunting Versus Compromise Assessments: What’s the Difference? Organizations must take a proactive approach to look for attackers on their network, because malicious hackers and criminals are always refining their techniques to avoid security tools and controls.Threat hunting and compromise assessments are terms that are used interchangeably to describe this activity, but there are some distinct differences. 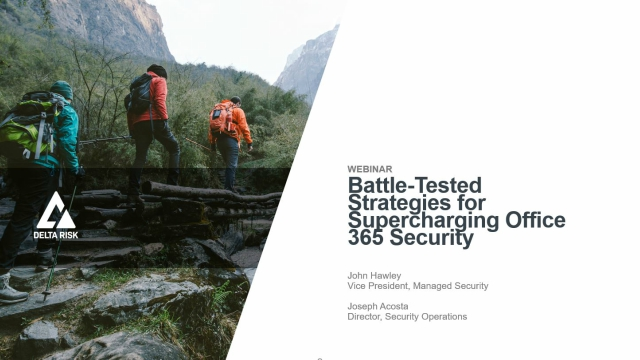 Join our experts for a live webinar with Q&A to learn why you need to devote resources to threat hunting and compromise assessments, whether it’s through dedicated teams or third-party services. Chris Gerritz, founder of Infocyte, is a retired Air Force officer and service-disabled veteran who is a pioneer in defensive cyberspace operations, having established and led the U.S. Air Force's first enterprise-scoped hunt team. Infocyte is the result of Chris’ experience hunting adversaries within some of the largest and most targeted defense networks in the world. Andrew Cook, CISSP, is the Manager of Delta Risk's ActiveResponse service. Drawing from his Air Force background, he is one of the firm's leading subject matter experts in cyber threat hunting and incident response. With more than six years of experience in cyber security operations, research, and development, Andrew is adept at managing technical teams and skilled in host forensics, network security analysis, malware reverse engineering and enterprise security assessments. In today’s threat landscape, it isn’t a question of if you’ll experience an incident, but when. When a security incident strikes, you’ll need a well-prepared staff and with a battle-tested plan. A mature incident response plan keeps everyone on the same page. It can clearly outline who’s in charge, what resources are available, and what options there are for detection and containment. Having a documented, tested process brings order to chaotic situations and keeps everyone focused on solving urgent issues. So, how can you test your incident response plan and ensure your team is ready to handle the next breach? Join our incident response experts for a 45-minute presentation plus Q&A to learn how you can quickly contain the impact of a breach, resolve an incident, and get back to business as quickly as possible. Stephanie Ewing is a Solutions Expert with Delta Risk. She has 17 years of experience in information technology and information security leadership. Prior to joining Delta Risk, she spent several years working with leaders of critical infrastructure organizations across the nation to improve their security programs. Through workshops, training classes, and tabletop exercises, Stephanie has worked to educate executive level leadership and elected officials on security threats and risk management strategies. Ryan Clancy is a Senior Associate for Security Operations Services with Delta Risk. He has more than 15 years of experience in the IT and cyber security domain providing consulting services, hunt operations, threat intelligence, cyber exercises, enterprise defense assessments, and training in defensive and offensive network security operations. In this webinar, we'll take a look at 2017 cloud data breaches: what went wrong and how to avoid the same fate. Is your organization using SaaS apps like Office 365 or G Suite? How about cloud infrastructure like AWS, Google Cloud, or Azure? The pace of business demands a cloud-first approach to move fast. The use of these services might not be new, but the accelerated rate of breaches on these services is alarming. The services themselves are secure but the task of configuring and using them securely is often left to your IT leaders, development teams, or even line of business managers. Cloud services introduce a new management plane, unfamiliar to every organization. The lack of visibility and control around these services is resulting in some of the most significant data breach incidents of 2017. What are some of the telltale signs a misconfiguration is going to put your critical assets at risk? How can you avoid a misconfiguration in the future? Join our team of cloud security experts for a 45-minute webinar to learn more about the steps you can take to improve your cloud security posture and keep your critical information protected. Mike Piscopo is Director of Technical Consulting Services for Delta Risk. Prior to joining Delta Risk, he was the Director of Information Risk Management and Information Security Officer for ING’s U.S. Financial Services division. Tools and technology can play a critical role in insider threat detection. However, tools alone are not enough to address the complexity of human behavior and determined threat actors. By combining technology with people and processes, however, you can create a human solution to solve a human problem. Ensuring you have an approach to incident response, a plan for technical recovery, and the ability to maintain patient care and business continuity in the event of an attack is key. How prepared is your organization? Join fellow CIOs, CISOs, and other IT and cyber security professionals for this interactive discussion on how to secure healthcare operations. Learn more about how to reduce the risks that cyber attacks can pose in this live 45-minute webinar presented by experts from Stanford Children's Health, Delta Risk, and Huntzinger Management Group as they discuss essential elements of how to respond to a cyber-attack and properly prepare a business continuity plan. Ed Kopetsky is Chief Information Officer at Stanford Children’s Health and an Advisor with Next Wave Health Advisors. He is responsible for the strategic direction for information technology and biomedical systems, and serves on multiple advisory boards for healthcare technology companies. Chris Holda is a Sr. Management Consultant with Huntzinger Management Group. He has more than 20 years of experience in IT Operations and 15 years in Healthcare IT. His areas of expertise include technical operations, technical infrastructure, system integrations, licensing and contracting. As a licensed attorney, he brings a unique hands-on perspective within Healthcare IT. Mike McKinley has more than two decades of experience in cyber and information security in both the private and public sectors. He serves as VP and GM at Delta Risk, where he manages a team of skilled consultants who specialize in providing healthcare and other critical infrastructure clients with advisory services, managed cyber security solutions, and incident response. In today’s digital world, insider threats are more prevalent than ever, but not any less difficult to detect and deter. Whether they’re malicious or unintentional, they must be guarded against equally. While you can’t directly control human behavior, you can implement safeguards to protect, detect, and respond to insider threats. One of the best ways to address insider threats is to implement a formal insider threat program in your organization. But what does an effective program look like, and who should be involved in developing it? If you’d like to learn more about preventing and detecting insider threats, join Delta Risk for this live 45-minute webinar. Our experts will discuss essential elements of an insider threat program, and why you need one now more than ever. To develop an effective program, you need good cross communication and participation across various departments, including information technology, security, cyber security, legal, and human resource. There are many roles and subject matter experts within these departments and others (i.e., system or network administrator, security analyst, data or network architect, information assurance specialist, legal specialist, financial specialist, behavioral specialist, etc.) who should participate in your insider threat program, and who will benefit from this webinar. Mike Jansen is a Senior Consultant with Delta Risk with more than 14 years of experience in cyber security and cyber operations. He areas of expertise include computer network operations, network security, acquisition and life-cycle management, testing and evaluation, training, cyber security frameworks, and cyber security technical controls.